Deposit rates are poised to go up. tanvi varma tells you what this means for your debt investments and how you can get the best returns without much risk. If the Reserve Bank of India, or RBI, has a bugbear, it is inflation. The central bank has increased key policy rates six times since March this year to control the rise in prices. The latest was during the mid-term review in September, when it raised the repo and reverse repo rates. Experts feel that the RBI is likely to tighten the screws further because, at nine per cent, headline inflation is well above its target of five to six per cent. "Controlling inflation will be a clear priority for the RBI during 2010-11," says Vaibhav Agrawal, Vice President of Research at Angel Broking. "We are likely to see an increase of half a percentage point in rates by the end of this year and another half a percentage point by the next policy meet. If this doesn't happen, inflation could go out of control," says Ritesh Jain, Head of Fixed Income at Canara Robeco Mutual Fund. Whether the RBI will be able to contain inflation is yet to be seen, but the latest increase has already led several banks to raise their base rates. This is bad news for borrowers because of bigger equated monthly instalments, or emis, and longer loan terms. It does not translate into good news even for investors in debt because bank deposit rates have not moved in tandem. Jain expects deposit rates to move up to 9-10 per cent only by the end of the year. You may not have to wait that long to gain from higher interest rates. Indian Overseas Bank, or iob, and State Bank of India, or SBI, are offering floating rate deposits, where the interest rate is linked to a benchmark rate and could change over the term of the investment. The interest rate of the SBI floating rate term deposits is linked to the bank's base rate. In the case of iob, the benchmark is the six-month daily average rate of government securities of an equal duration. The 3-5-year deposits are linked to the five-year gilts, while 5-10-year deposits are benchmarked to 10-year bonds. These deposits will be useful if you think interest rates will move up in the months to come. If SBI revises its base rate (many banks did so in the first week of October), the deposit rate will go up automatically. However, this benefit comes with strings attached. If rates go down, so does the payable interest. Debt funds, though, outperform in a soft interest rate regime. When rates go down, debt funds do well, and vice versa. Now, the bond market has not done too well in the past 12 months when rates have been on the rise. The 10-year benchmark yield has moved up from seven per cent in 2009 to over eight per cent now. Given the inverse relationship between bond yield and prices, the net asset values, or navs, of debt funds with long-term bonds have suffered. Most categories of debt funds have given low, single-digit returns in the past one year (see Debt Fund Returns are Dismal). There is, however, a strategy that insulates you from the volatility in interest rates, gives you stable returns and also offers higher liquidity. You need to stagger your investments in deposits of different terms. 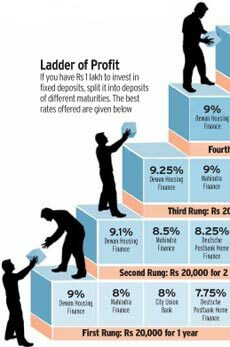 Suppose you have Rs 1 lakh to invest in fixed deposits. Invest Rs 20,000 each in fixed deposits of one, two, three, four and five years. After a year, when the one-year deposit matures, reinvest the proceeds in a five-year deposit. By then, all the other fixed deposits, or fds, would be a year closer to maturity. This iron-clad approach is known as laddering. It helps you get the best returns without exposing you to the interest rate risk. By using the ladder of fds, you are spared the trouble of trying to predict which way the interest rates will move. Since some of your deposits mature every year, this also offers you higher liquidity and the chance to latch on to a higher rate if they have gone up. On the other hand, if the rates go down, you won't be stuck with an entire portfolio of low-yield bonds. For terms of five and six years, use instruments such as bank deposits (five years) and national savings certificate, or nscs, (six years), which can also help you save tax under Section 80C. Similarly, you can build a ladder of fixed maturity plans, or fmps, offered by fund houses. fmps invest in bonds and hold them till maturity, so there is no interest rate risk. The base portfolio is locked in and structured to mature at redemption. So, whether rates rise or fall in the interim, the asset value is protected. "fmps tend to give higher returns than the benchmark rates," says Vineet Arora, Head of Product and Distribution at icici Securities. Currently, 12-13-month fmps can give returns of 8.5-9 per cent, while three-year fmps can yield about 10 per cent. However, regulatory guidelines prevent mutual funds from stating explicitly the returns that investors can expect. FMPS are also tax-efficient because, after a year, gains from fmps are treated as long-term capital gains and taxed at a lower rate. The interest from fds is added to your income and taxed at the applicable rate, which can be as high as 30 per cent in the highest tax bracket.